Steven Winn is an award-winning arts journalist and fiction writer. A longtime staff writer at the San Francisco Chronicle, he has held a Wallace Stegner Fellowship in fiction at Stanford University and received two-first place Excellence in Writing Awards from the American Association of Sunday and Feature Editors (AASFE), along with multiple prizes from the Press Club of the East Bay and the Peninsula Press Club. 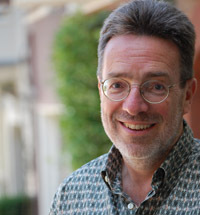 Winn spent many years as the Theater Critic at the Chronicle and was the paper's Arts and Culture Critic from 2002-2008. 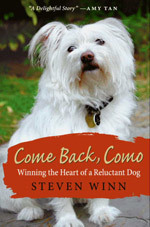 Winn is the author of Come Back, Como: Winning the Heart of a Reluctant Dog (Harper), the story of a unique journey: one man's valiant quest to win the love of a truly one-of-a-kind dog, a man-fearing, master escape artist who wanted nothing whatsoever to do with him. Winn's series of 10 stories about his family's life with their dog Como began running in the San Francisco Chronicle in 2004. The series turned Como into a local celebrity, who appears with Winn at readings and events and is frequently recognized on the streets and in the parks of San Francisco. Accomplished in media and public speaking, he is an ideal keynote speaker for colleges, libraries, museums, and distinguished lecture series. Winn has appeared on 20/20, The Today Show, NBC Nightly News, A&E Biography, and numerous radio programs. He has conducted 20 onstage interviews for San Francisco's City Arts & Lectures series, which is heard nationally on NPR affiliates. Annette Bening, Steve Martin, Frank Rich, Dan Savage and John Updike are among those Winn has interviewed. Winn is also the co-author of Ted Bundy: The Killer Next Door (Bantam,1980) and Great Performances: A Celebration (Bay Books, 1997). His first-person essays have appeared in Good Housekeeping, Parenting, and Parents and in such newspapers as the Baltimore Sun, Cleveland Plain Dealer, and Seattle Times. His short fiction has been published in the Carolina Quarterly, Colorado Review, Indiana Review, National Lampoon, and elsewhere. His poems have appeared in the Florida Review, Prairie Schooner, Southern Poetry Review, and others. He is a graduate of the University of Pennsylvania (B.A., 1973) and the University of Washington (M.A., 1975). He was a founding staff member of the Seattle Weekly and has written for AARP magazine, Humanities, the New York Times, Sports Illustrated, and Utne Reader. "A delightful story about the joys and deeper meanings dogs bring into our lives." "As a man owned by a dog, I read this book with delight, merriment, and deep sympathy. And when I reached the most touching parts there was my dog's head, in my lap - he knew I had a heart all along." "Even people who don't much care for dogs, and I am one, will be moved and entertained by Steven Winn's story of pursuit and rejection and renewed pursuit between man and pooch. Its real subject, transcending species, is the struggle for understanding between minds and hearts."